Michel Barnier, ‘the most dangerous man in Europe,’ with Austrian Chancellor hopeful Sebastian Kurz. 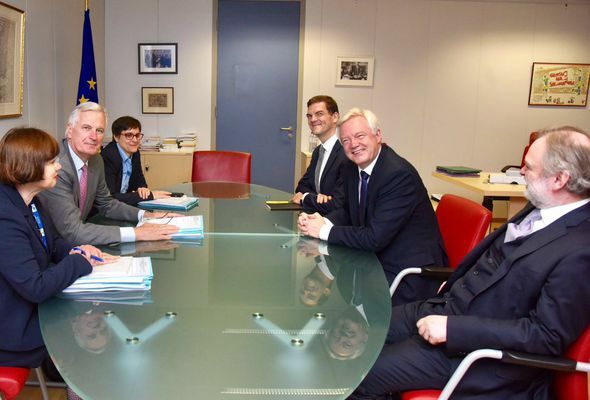 BRUSSELS – The photo of UK Secretary for Brexit, David Davis, sat opposite the EU’s chief Brexit negotiator, Michel Barnier, is telling, says Georis in his editorial column. Davis, grinning, is empty-handed. Barnier’s hands rest on a stack of pre-prepared documents. Davis was in Brussels for less than an hour on Monday (17/07) as round 2 of the Brexit negotiations got underway, though his team claims his early departure was planned. Barnier is keen to get stuck into negotiating the UK’s “financial obligations.” The projected cost of the divorce bill is currently hovering in-between €50 and €60 billion. And Conservative in-fighting suggests even the government haven’t agreed on a Brexit stance, and all the while, the clock ticks, as Barnier reminded Boris Johnson last week. As required by Article 50, the agreement must be ratified by March 2019, which means Brexit negotiations must end by October 2018. The EU may seem to be on top, but they are dealing with ‘the craftiest of negotiators,’ says Georis, ‘who are capable of bogging them down in technical discussions’ wearing that same relaxed grin. ‘The risk of not coming to an agreement within the 15 months is real,’ he adds. ‘Other European countries would see that it is possible to leave the EU without negotiations,’ which would make Europe ‘far weaker,’ and would undermine decades of cooperation and progress.